CMD, US-based designer of rotary bag making machines, will introduce a new bag machine and winding system at CHINAPLAS 2013. 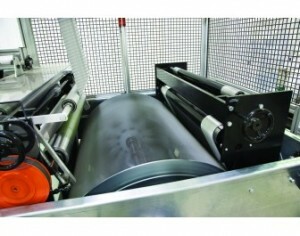 The CMD 864 Global Bag Machine and Winder has the advantages of continuous-motion sealing at an economical price. It is equipped with proven-robust technology that is simple to operate, has low maintenance requirements, quick changeover and exceptional throughput. Its patented CMD continuous-motion technology provides a wider processing window than traditional, intermittent-motion or shuttle-style bag machines as it seals a wide variety of film structures and gauges. CMD rotary sealing allows for adjustment of dwell, or amount of time the heated seal bar is in contact with the film. This technology can easily convert at up to 450f/m (138m/m) quality bags made from bio-resins, post-consumer recycled (PCR) contents, or down-gauged films. At the heart of the economical Global Bag Machine and Winder is a unique seal drum design that allows for fast, simple changeover from job to job. The infinitely adjustable seal drum provides the flexibility to run a variety of product sizes. CMD says its machine is compact, CE-compliant and economical to ship. Universal touch-screen icons on the easy-to-use HMI result in fewer errors and improved process control.